Every angler says to himself I want to fish the next pool upstream. On this particular stream I've said the same many, many times, but for reasons of access I never did until Tuesday. The lower stream has been good to me for years, giving up brookies of various sizes. So after fishing for about an hour I began my quest of finding what it was like around the bend and upstream. What I found was a rugged freestone stream that was flowing swiftly. The stream was apparently up from recent rains. Some sections were open along the bank and others completely down right nasty. Large boulders created pockets that had to hold fish. There were places where I crossed the stream to be able to fish, and doing so I stepped into holes that almost covered the top of my hippers. Noticing a small amount of sulphurs about I put on a fly of similar color and was able to bring a fish to the surface. The pockets where the trout held were hard to work and the presentation seemed like it was never going to happen right, but when it did you had a fish on. I was able to fish this area and had the fortune to take many beautiful wild brookies. All of the brookies were about the same size this day. I knew by some of the hits I felt that there were larger trout here. This swift run produced a brookie. As the fly got sucked under towards the back I pulled and lifted it up. The trout struck it and was on. Moments later this fine brook trout lay in my hand. I think there may bigger guys than this lurking about. A beautiful stream, and some places as such I should let be. It's very easy to fall and a broken bone quite the possibility. I walked around this jam and fished the pool above it. There were quite a few green inch worms about. The closest fly I had to it was a partridge and green soft hackle. In the swift current if it is similar they will eat it. As I reached into the water to lift this wild jewel up I was startled by what I saw. I tell that story at another time. A fine few hours were spent upstream. Wonderful surroundings and wild brook trout. "Life is truly sweet". Memorial Day weekend, a long weekend for most and the official start of summer. Here in the northeast is was a bit strange. One day was cold, rainy and for some there was quite a bit of snow. One day was a transition back to some decent spring weather and the last day was pretty nice. My weekend was pretty full. Saturday was my grandson Ethan's birthday, "Happy Birthday Ethan" the family had a great time. Yesterday was a family gathering for a little cookout. Lots of burgers, hot dogs, and the stuff that brings it all together. Sunday the middle day I managed to get in some time to do some fishing. A small stream that had managed to come up some do to recent rains. The water was clear and a drop of the thermometer brought a reading of 54 degrees. The day in general was a transition of sun and clouds, some wind and rain. The streams thick leaf canopy allowed only the sun to pass through. There were small sulphurs on the water, and the few rises I saw were of the trout taking them. I fished a sulphur imitation and in a quiet run had my first hookup. This little wild brown sipped that sulphur and when hooked put up a good accounting before coming to hand. There are sections of this stream I've never fished, on this day I also explored. Parts of it are thick with laurel, but others open up. I found many swift runs and pockets, areas I love to fish. And in these runs and pockets I found willing brook trout. This one with his hooked upper jaw will be a beautiful representative come Autumn. Spring flowers are about, there beauty is awesome. A sulphur. A beautiful dainty mayfly. They had the trouts attention today. The section where the log enters the water had several natural sulphurs eaten up by a fish. After watchcing this I sent my fly through. It produced a violent strike on the small fly. Soon this beautiful wild brook trout was to come to hand. A quick photo and back to his cold lie. I continued to explore this stream, but there is much more to check. The last brookie of the day. I was fortunate to fish this day, and I know that part of that opportunity was given to me by those who have fallen in so many wars. This is an outing I took last Thursday. It's a small stream that flows through a big piece of state land. I have fished a small segment in the lower reaches of it numerous times but have never ventured further up into the woods to see what it offered. Late last fall or early winter I searched it in another area. I caught one nice brookie, and the stream looked like it had potential. Kirk paid a visit to it in winter and he felt the same way. So Thursday in the overcast, and from time to time rain I ventured further upstream and found some very good fishing for wild brook trout. The stream has some very good access in places, but others are like a jungle. The water temp was 56 degrees, quite cold. There are numerous undercuts and a good ratio of riffles and pools, real primo brookie water. Like most small streams the insect hatches are sparse but one fly I noticed quite a bit was a cream colored caddis. So I tied on the closest thing I had to it which was a cream colored, almost pink parachute dry. Well they hit that fly very well. On and off rain produced some beautiful images. The smell of a wet fir and hardwood forest is intoxicating. I find all wild brook trout to be the most beautiful creatures on this earth. 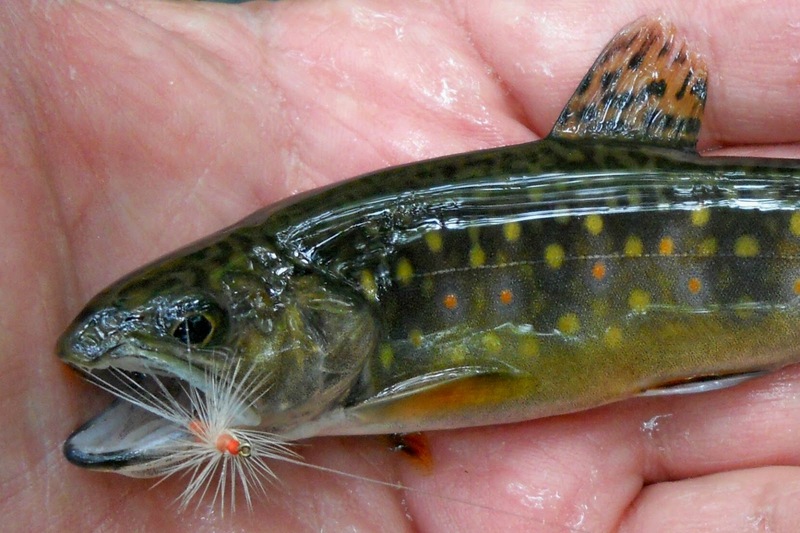 The brookies in this stream have a concentrated beauty in their small bodies. Their colors and needle point dots are spectacular. Having explored this section I now must fish further upstream and see what waits. Absolute wild beauty in a compact form. The Pocono mountains of eastern Pennsylvania are probably best known for their status as the place for honeymoons. To those who fly fish it's also a trout paradise, both small stream and bigger. Many anglers believe that dry fly fishing in the United States first originated here, and in particular on Brodhead Creek. Brodhead Creek flows to meet the Delaware and offers some fantastic fly fishing. 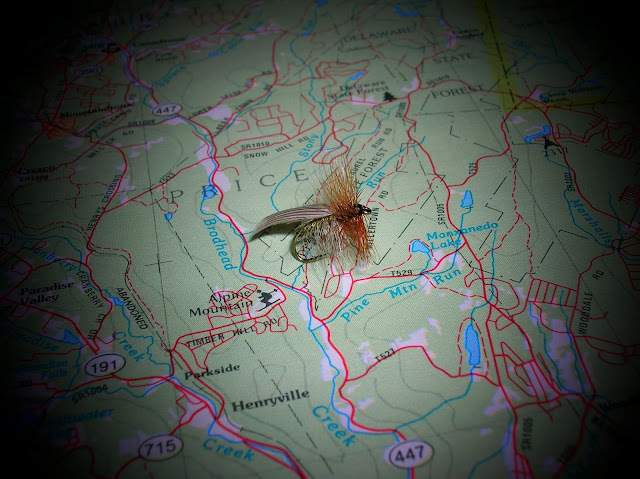 One section called the Henryville is where this fly gets its name. The "Henryville Special" was created by Hiram Brobst back in the thirties. It is a caddis fly and has a reputation as a fish taker. 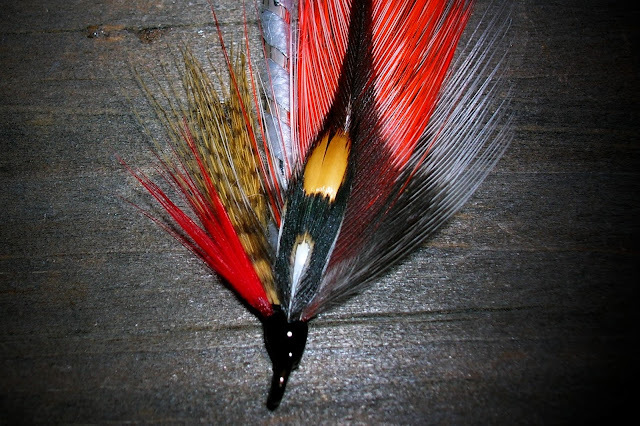 A versatile pattern it can be fished dry in a traditional manner or one can swing it as a wet fly and it works very well skittered across the surface. I have carried and fished the Henryville Special since taking up fly fishing. They say every fly has its day, but I'd bet this one would have that day every day. This is a small stream in the Poconos I've fished many times. The Henryville Special has worked very well here. This small stream in Connecticut I fished the other day. In this little riffled run I managed to have four hookups. They were taken on a variety of presentations. Of the four hookups, this wonderful wild fella is the only one to allow me a photo. So if you haven't tried the Henryville Special, I would highly recommend you try it. The fly works in sizes 12 to 16. I haven't posted a streamer in some time. 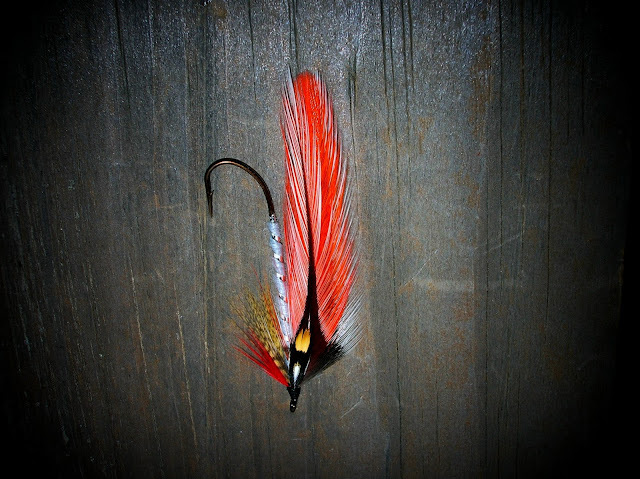 So yesterday I tied this featherwing streamer and thought I'd share it with you. It's an attractor pattern I created for use in the fall. Yesterday we took a trip to a special stream in Massachusetts. It's a coastal stream that flows into the salt water on Cape Cod. I have fished this stream for about 5 years now and have been blessed with wonderful outings each time. This stream is a fresh water stream that is about 5 miles long. 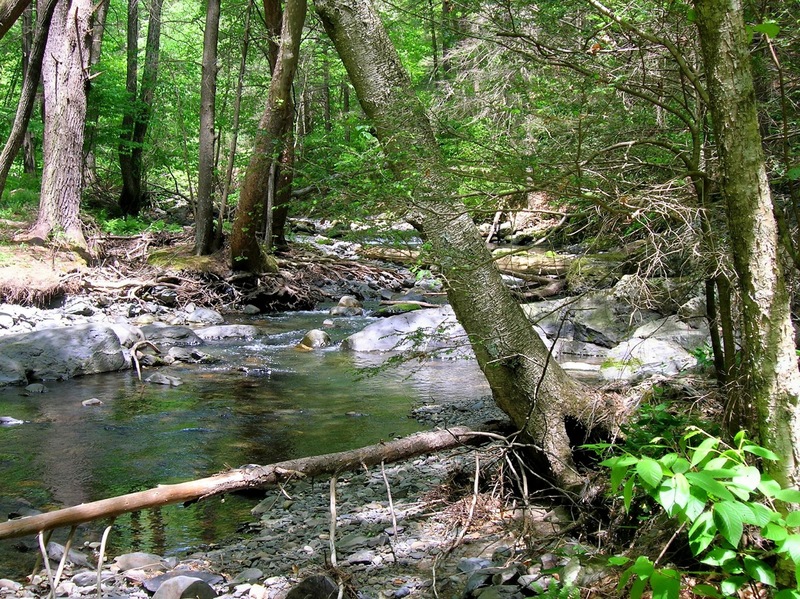 It has several cold springs along its length making it suitable for wild brook trout. These brook trout are a special group. Some of them will go to sea and spend part of there life there returning back to the fresh cold waters of Red Brook. To spend time here is a most pleasant and rewarding experience. To see the awesome work that has taken place here over the years. Many groups have been part of this effort to protect this habitat and the "Salters" that call Red Brook home. Mass. Fish and Wildlife, Trout Unlimited, Trustees of Reservations, and The Lyman family who donated the land that Red Brook flows through. Hopefully Red Brook will remain safe and protected for generations to come. Native grasses and trees were planted to protect the stream. While not your typical freestone mountain stream Red Brook provides many challenges to the fly angler. A walk along the stream provides the angler with a vast amount of sights, sounds and smells. One such smell is that of salty air mixed with pine. Ospreys can be seen circling over head, and the bird symphony is sweet music. There is no rush. Take time to enjoy a lunch. This is danger to most everybody. While these are brook trout they do not act like other brook trout. They do not take flies that represent insects. They have a profound love of streamers. Red Brook having access to the sea also host a good run of herring. Herring spawn and porvide the brook trout an ample source of herring fry to dine on. Thus the fondness of streamers. This simple marabou streamer was very productive. Red Brook has a very sandy bottom. You must look for the gravel that has been washed out, along with underwater structure and you'll find brook trout. 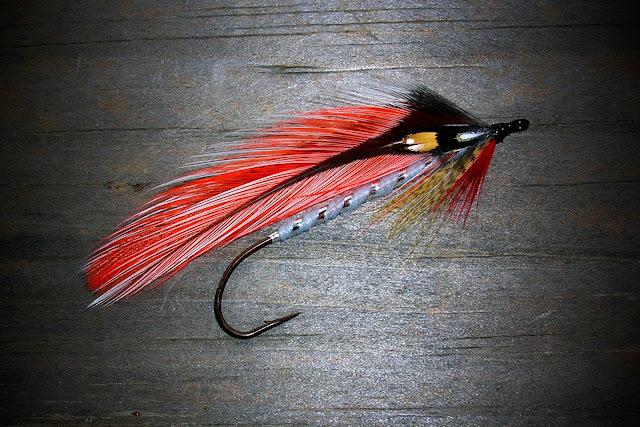 As you can see these brookies will take a streamer. Quite a few of these guys were hooked, and a few came to hand. You can see the reddish tint to the water, giving Red Brook its name. In the water are islands of green vegetation. Work your streamer near and perhaps you'll get lucky. Such was the case yesterday. 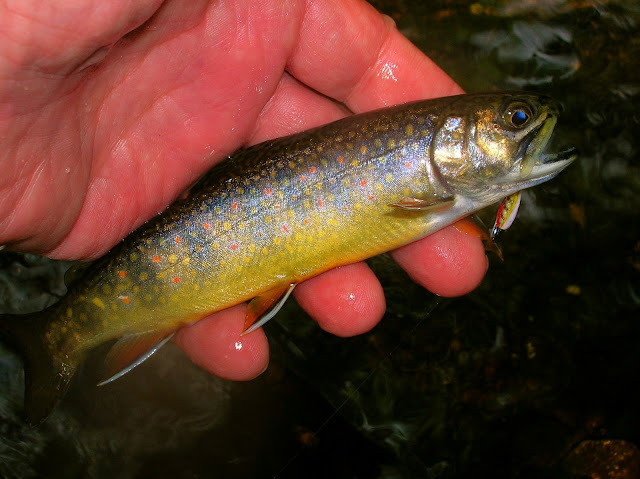 A beautiful Red Brook wild brook trout. Perhaps this fish will take to the salt. Buttermilk Bay, and Cape Cod. May the "Salter" brook trout swim these waters forever. I have a link posted below for the Searun Brook Trout Coalition. A great organization dedicated to the "Salter" Check them out.